Physicist Reed Richards is convinced evolution was triggered millions of years ago on Earth by clouds of cosmic energy in space and has calculated that one of these clouds is soon going to pass near Earth. Together with his friend, astronaut Ben Grimm, Reed convinces Victor Von Doom, his former classmate at MIT and now CEO of Von Doom Industries, to allow him access to his privately held space station to test the effects of a biological sample of exposure to the cloud. Victor agrees in exchange for control over the experiment and a majority of the profits from whatever benefits it brings. Reed brings aboard his ex-girlfriend and Von Doom's chief genetics researcher Sue Storm and her ex-astronaut younger brother Johnny Storm. The quintet travels to outer space to observe the cosmic energy clouds, but Reed miscalculates and the clouds materialize ahead of schedule. Reed and the Storms leave the shielded station to rescue Ben, who had gone on a spacewalk to place the samples. Ben receives full exposure in outer space, while the others receive a more limited dose within the station. Back home they soon develop superpowers: Reed can stretch his body like rubber, Susan can become invisible and generate force shields, Johnny Storm can engulf himself in fire and fly unaided, and Ben becomes a rock-like creature with superhuman strength and durability. Meanwhile, Victor faces a backlash from his stockholders because of the publicity from the space mission, and has a scar on his face that came from an exploding control console on the station. Ben's fiancée Debbie cannot handle his new appearance and leaves him. Ben goes to brood on the Brooklyn Bridge and accidentally causes a traffic pileup while preventing a man from committing suicide. Ben, Reed and the Storms use their various abilities to contain the damage and prevent harm, including saving the crew of an FDNY ladder truck that nearly fell off the bridge due to the chaos. The media dub them the Fantastic Four. They move into Reed's lab in the Baxter Building to study their abilities and seek a way to return Ben to normal. Victor, himself mutating, offers his support but blames Reed for the failure of the spaceflight, which has lost him his company's hope for an IPO. Reed tells the group he will construct a machine to recreate the storm and reverse its effects on them, but warns it could possibly accelerate them instead. Meanwhile, Von Doom's arm has become organic metal, giving him superhuman strength allowing him to produce bolts of electricity, and he begins plotting revenge. He drives a wedge between Grimm and Reed, who has rekindled his relationship with Susan Storm. Using the machine, Victor restores Grimm to human form, while accelerating Von Doom's condition, causing much of his body to turn to metal. Victor knocks the human Ben unconscious and captures Reed. Now calling himself Doctor Doom, he puts on a metallic mask and a cloak to hide his disfigurement, Victor then tortures Reed and fires a heatseeking missile at the Baxter Building in an unsuccessful attempt to defeat Johnny. Sue confronts Victor but is outmatched. Ben arrives to assist her, transformed into the Thing again by reusing the machine. The battle then spills into the streets, the Storms combine their powers to wrap Victor in an inferno of intense heat, while Ben and Reed douse him with cold water, inducing thermal shock and freezing Doom in place. Ben informs Reed that he has accepted his condition with the help of Alicia Masters, a blind artist for whom he has developed feelings, and the team embraces its role as superheroes. Reed proposes marriage to Sue, who accepts. Meanwhile, Victor's statue-like remains are being transported back to his homeland of Latveria when the dock master's electronic manifest briefly undergoes electromagnetic interference. Rachel McAdams, and Keri Russell were considered for Sue Storm. As in almost all of the previous Marvel Comics-based films, Fantastic Four co-creator Stan Lee makes a cameo appearance. He is Willie Lumpkin, the postal worker who greets the team on their way to the Baxter Building elevator, making this cameo the first time in which Lee appeared playing a character he created; the second and last time was Lee's appearance as J. Jonah Jameson in the 2018 animated film Spider-Man: Into the Spider-Verse. Hugh Jackman reprises his role as Wolverine in a scene in which Reed Richards changes his face to resemble Jackman's portrayal of Wolverine in an attempt to woo Sue Storm; the scene was deleted from the theatrical cut of Fantastic Four and was restored in the "Extended Cut" of the film. In 1983, German producer Bernd Eichinger met with Stan Lee at his home in Los Angeles to explore obtaining an option for a movie based on the Fantastic Four. The option was not available until three years later, when Eichinger's Constantin Film company obtained it from Marvel Comics for a price the producer called "not enormous", and which has been estimated to be $250,000. Warner Bros and Columbia Pictures showed interest, but were cautious of Eichinger's $40–45 million budget. With the option scheduled to expire on December 31, 1992, Eichinger asked Marvel for an extension. With none forthcoming, Eichinger planned to retain his option by producing a low-budget Fantastic Four film, reasoning, he said in 2005, "They didn't say I had to make a big movie." In 1992 he approached B-movie specialist Roger Corman on the idea of producing the film on a $5 million budget in order to keep the rights, which he eventually decided to bring down to $1 million. 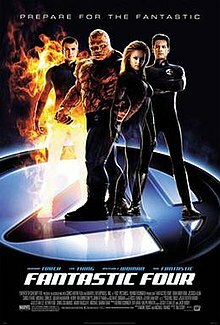 In 1994, the adaptation, titled The Fantastic Four, had its trailer released to theaters, and its cast and director went on a promotional tour, however the film was not officially released. The film was accused of being an ashcan copy, meaning it was only made to keep the license. Lee and Eichinger stated that the actors had no idea of the situation, instead believing they were creating a proper release. Marvel Comics paid in exchange for the film's negative, so 20th Century Fox could go ahead with the big-budget adaptation, as well as a possible spin-off film starring the Silver Surfer for summer 1998. Fox hired Chris Columbus to write and direct Fantastic Four in 1995. He developed a screenplay with Michael France, but decided to step down as director and focus on producing Fantastic Four under his 1492 Pictures company. Peter Segal was hired to direct in April 1997, and was replaced by Sam Weisman by the end of the year. Fox brought in Sam Hamm to rewrite the script in April 1998 in an attempt to lower the $165 million projected budget. In February 1999, with development taking longer than expected, Eichinger and Fox signed a deal with Marvel to extend the control of the film rights for another two years, with a summer 2001 release planned, and hiring Raja Gosnell to direct. However, Gosnell decided to do Scooby Doo instead and dropped out in October 2000. He was replaced by Peyton Reed in April 2001 and Mark Frost was brought on board for another rewrite. Reed departed in July 2003, explaining in 2015, "I developed it for the better part of a year with three different sets of writers. But it became clear after a while that Fox had a very different movie in mind and they were also chasing a release date … so we ended up parting company." Tim Story was signed to direct in April 2004, after Fox was impressed with his early cut of Taxi. Simon Kinberg wrote uncredited drafts of the script. After seeing The Incredibles, the producers of the film were forced to make significant script changes and add more special effects because of similarities. The American premiere of Fantastic Four was moved from July 1, 2005, to the week of July 8 to avoid competition with Steven Spielberg's motion picture War of the Worlds, during its first week. Fantastic Four opened in 3,602 movie theaters in the United States, and increased to 3,619 theaters in the following week. In paid attendance, Fantastic Four was a commercial success, and achieved the top position in gross income, making $56,061,504 during its first weekend, from 3602 theaters. By the end of 2005, Fantastic Four had accumulated a gross income of about $330,579,700 from theaters around the world, about $154,696,080 of this coming in the United States. On Rotten Tomatoes the film has an approval rating of 27% based on 210 reviews with an average rating of 4.5/10. The site's critical consensus reads, "Marred by goofy attempts at wit, subpar acting, and bland storytelling, Fantastic Four is a mediocre attempt to bring Marvel's oldest hero team to the big screen." On Metacritic, the film has a score of 40 out of 100 based on 35 critics, indicating "mixed or average reviews". Audiences polled by CinemaScore gave the film an average grade of "B" on an A+ to F scale. At the Saturn Awards, Fantastic Four was nominated for Best Science Fiction Film, but lost the trophy to Star Wars: Episode III – Revenge of the Sith. It was given two nominations at the 2006 MTV Movie Awards including Best Hero for Jessica Alba (she lost to Christian Bale for Batman Begins) and Best On-Screen Team for Alba, Michael Chiklis, Chris Evans and Ioan Gruffudd (they lost to Vince Vaughn and Owen Wilson for Wedding Crashers). Alba was nominated for a Razzie Award for Worst Actress for her performances in both this film and Into the Blue, but lost to Jenny McCarthy for Dirty Love. There is a scene where Reed and Sue are in a storage room of the Baxter Building. On one of the shelves is a robot that is supposed to be H.E.R.B.I.E. from the Fantastic Four animated cartoon series from 1978. The biggest change is of the scene with Jessica Alba and Ioan Gruffudd's characters looking toward the Statue of Liberty. Similar lines are used in the DVD version, but the version on DVD replaces that with the pair in the planetarium, where they discuss their feelings for each other without an argumentative tone. The DVD includes the theatrical version as a bonus feature, but instead of Reed forming a square jaw, as he does in the theatrical version, he makes his skin look like that of Wolverine of the X-Men comics. The actor Gruffudd breaks the fourth wall and looks directly at the camera as he does this. The extended cut includes this as part of the movie, along with a longer version of the scene in the planetarium. There are no beep sounds when Dr. Doom fires his heatseeking missile. The theatrical version shows Doom saying "And to think I was going to spend the rest of my life with you" when attacking Sue Storm, but in the DVD version, it depicts him laughing instead. Three slightly modified scenes concerning the attack on Dr. Doom - one in which Reed uses his body as a funnel to direct a stream of water at Doom, one in which he does not, and one in which Doctor Doom's line "Is that the best you can do, a little heat?" is cut short, having the "..a little heat?" portion removed. The novelization of the motion picture contains a number of scenes that were not in the final cut of the movie, including a small number that developed the character of Alicia Masters. The movie was also released on VHS the same day, it was later released on Blu-ray on November 14, 2006. In June 2007, an extended cut DVD of Fantastic Four was released. It incorporated about 20 minutes of deleted scenes, and also included a preview of the sequel, Fantastic Four: Rise of the Silver Surfer. The DVD expanded on The Thing's relationships with Alicia Masters, Doctor Doom's manipulations to break up the group, and the Human Torch's womanizing, and how it backfires. Fantastic 4: The Album is the official soundtrack to the movie Fantastic Four. The soundtrack features two supergroups that were formed specifically for the album: Loser (former Marilyn Manson guitarist/writer John 5) and T.F.F. (featuring Brody Dalle of The Distillers, Chris Cester of Jet, Nick Zinner of The Yeah Yeah Yeahs, and Dolf de Datsun of the Datsuns). An album of John Ottman's score was released by Varèse Sarabande on July 12, 2005. A sequel, Fantastic Four: Rise of the Silver Surfer, was released on June 15, 2007. Director Tim Story returned, and the cast reprised their roles. In the film, the Fantastic Four encounter the Silver Surfer. The sequel had a mixed but overall better reception than its predecessor. When plans for a sequel to Rise of the Silver Surfer fell through, 20th Century Fox rebooted the series with the critically panned Fantastic Four (2015). ^ a b c "FANTASTIC 4". BFI. Retrieved 4 October 2014. ^ "Fantastic Four". American Film Institute. Retrieved October 28, 2016. ^ "Fantastic Four (2005)". AllMovie.com. Retrieved June 13, 2015. ^ a b c "''Fantastic Four''". Box Office Mojo. Retrieved 2011-04-20. ^ "IGN INTERVIEWS RACHEL MCADAMS". IGN. June 23, 2004. p. 4. Retrieved November 1, 2014. ^ Dave McNary (2004-07-07). "Fox near to quorum for 'Fantastic' quartet". Variety. Retrieved 2014-10-11. ^ Matthew Kirdahy (7 February 2008). "Q&A With Stan Lee". Forbes.com. Accessed February 7, 2008. ^ "7 Times Comic Book Movies Had Crossovers Before Marvel". 7 January 2016. ^ Ito, Robert (March 2005). "Fantastic Faux!". Los Angeles. p. 109. ^ a b Army Archerd. "Peters, Geffen in talks to buy Bel-Air Hotel". Variety. ^ Muto, Sheila (September 1994). "The Fantastic Four Movie You'll Never See". Wired. Retrieved June 18, 2009. ^ "Fantastic Four (1994)". UGO. Archived from the original on November 5, 2007. Retrieved September 26, 2007. ^ "Comics Scene 34 Superman Fantastic Four - eBay". Retrieved 4 October 2014. ^ a b c Michael Fleming (1997-04-14). "A Mania for Marvel". Variety. Retrieved 2014-10-09. ^ Army Archerd (1995-07-13). "Columbus seeing red after 'Nine' reviews". Variety. Retrieved 2014-10-09. ^ Andrew Hindes (1997-12-11). "Weisman set to helm 'Out-of-Towners'". Variety. Retrieved 2014-10-09. ^ Staff (1998-04-14). "Midler tries on noir; New Line keys on prodigy". Variety. Retrieved 2014-10-09. ^ Chris Petrikin (1999-02-08). "Marvel, Fox pact for pix". Variety. Retrieved 2014-10-09. ^ Chris Petrikin (1999-07-27). "Under construction". Variety. Retrieved 2014-10-10. ^ Michael Fleming (2000-10-17). "WB's 'Scooby' gets live-action greenlight". Variety. Retrieved 2014-10-10. ^ Dana Harris (2001-04-25). "Reed takes on Fox's 'Fantastic' project". Variety. Retrieved 2014-10-09. ^ Gary Susman (2003-07-30). "Invisible Guy". Entertainment Weekly. Retrieved 2014-10-10. ^ Parfitt, Orlando (July 16, 2015). "How Ant-Man Director Peyton Reed Fell Out With Fox Over Fantastic Four (Exclusive)". Yahoo! Movies UK. Archived from the original on July 28, 2015. Retrieved July 28, 2015. ^ Claude Brodesser. "Fox 'Four' play heats up". Variety. ^ Scott Brown (2005-07-01). "Fantastic Voyage". Entertainment Weekly. Retrieved 2014-10-10. ^ Susman, Gary (October 1, 2004). "Fox moves ahead on X-Men 3". Entertainment Weekly. Archived from the original on September 9, 2015. Retrieved September 9, 2015. ^ Patrick Sauriol (December 24, 2004). "SCOOP: Stretching the end of FANTASTIC FOUR". Archived from the original on July 6, 2008. ^ Lichtenfeld, Eric (2007). Action Speaks Louder. Middletown, Connecticut: Wesleyan University Press. p. 241. ISBN 0-8195-6801-5. ^ "Fantastic Four (2005) - Weekly Box Office". Box Office Mojo. Retrieved March 22, 2011. ^ "Fantastic Four". Rotten Tomatoes. Fandango Media. Retrieved 2014-11-10. ^ "Fantastic Four (2005)". Metacritic. CBS Interactive. Retrieved 2014-11-10. ^ "26th Annual Razzie Awards Press Release". Archived from the original on 2006-02-03. ^ a b "Fantastic Four (Comparison: US Theatrical Version - Extended Version)". Movie-Censhorship.com. Retrieved April 24, 2012. ^ Spence D. (July 7, 2005). "Fantastic Four -The Album". IGN. Retrieved April 17, 2013. ^ Loftus, Johnny. "Fantastic Four [Original Soundtrack]". Allmusic. Retrieved April 17, 2013. ^ Sung, Mark (2005-06-07). "Fantastic Four: The Album Details". Monsters and Critics. Archived from the original on 2012-07-22. Retrieved 2011-04-20.